Is there a way to archive iPhone text messages? I like to keep my messages list short. I also want to refer to a message I have deleted a week or two earlier. Is it possible to archive messages from a single sender or to archive all messages received at the end of the day? Once upon a time, Micromat made a tool called Syphone that did the job, but it hasn’t been updated in years and I’ve had no luck with it recently. I have had nothing but luck, however, with Ecamm Network’s $20 PhoneView ( ). PhoneView lets you copy SMS messages on your iPhone either as text or xml files. It can copy all your messages, all messages from a particular sender, or individual messages from a particular sender. 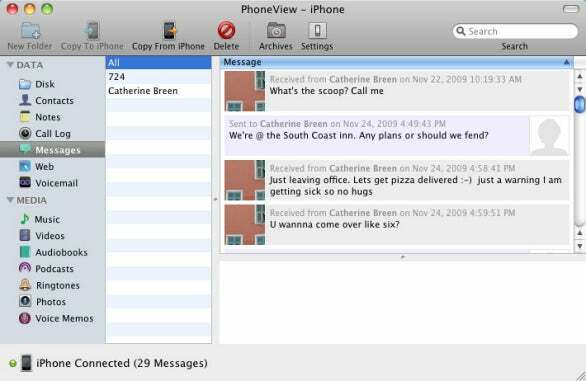 Just jack in your iPhone to your Mac, launch PhoneView, select Messages in the column on the left side of the PhoneView window, select the messages you want, and click the Copy From iPhone button. This is just one of PhoneView’s talents. It can additionally copy the iPhone’s contacts, notes, call log, bookmarks, voicemail, music, videos, audiobooks, podcasts, ringtones, photos, and voice memos from the iPhone to your Mac. And with it you can use the iPhone or iPod touch as a storage device. Just click PhoneView’s Copy To iPhone button, choose from the sheet that appears the files you want to copy to the device, and click Select. Optionally, there are ways to do this by jailbreaking your phone and copying the SMS SQLite database file to your Mac (that file can be found by following this path: /var/mobile/Library/SMS/sms.db). You can read the contents of the file with the open source SQLite Database Browser.